According to new satellite imagery of the area, a giant blue hole was recently discovered within Australia's Great Barrier Reef. "What we found inside was hard to believe considering 5 months ago a Category 4 cyclone went straight over the top of it." According to Gaskell, pristine colonies of giant birdsnest corals and extremely long Staghorn corals found in the "blue hole," were completely unaffected by Cyclone Debbie, which slammed into the region as a Category 4 storm back in late March. Blue Hole mission in the Great Barrier Reef. This Blue Hole has previously been explored and documented by geologists who suggested it could be even older than the famous Great Blue Hole, in Belize. It's location is in one of the least explored parts Great Barrier Reef, over 200km from our home @daydreamislandresort. Gaskell began searching for blue holes in March last year after Cyclone Debbie hit, in hope of finding coral that was spared from the storm. The high walls that line the sinkholes tend to preserve what lies below from damaging weather. Large hurricanes can be particularly dangerous for corals, as they are smashed by swells. The blue hole that Gaskell spotted on Google Maps was in a remote location, nearly 190 kilometres away from the nearest island. While the specific blue hole had been previously identified, its remoteness made it difficult to access and little was known about it. Gaskell was able to finally confirm that it was a blue hole during the diving expedition in September. The majority of blue holes are formed from sinkholes or caves that develop slowly over time, as rock begins to erode and collapse. Many of the world’s blue holes formed during the last Ice Age, after sea levels rose and filled existing sinkholes with water. The term blue hole simply comes from the dark, navy waters that characterise the formations, often creating a striking contrast with the turquoise that surrounds them. “This Blue Hole has previously been explored and documented by geologists who suggested it could be even older than the famous Great Blue Hole, in Belize." Was well worth it! Inside the walls was similar to the site we explored a few weeks back, but this hole was deeper and almost perfectly circular. We dived down to just over 20m yesterday, before hitting bare sediment, that slowly sloped towards the centre. Again it was great to see big healthy coral colonies. “Due to the sediment build-up over thousands of years, blue holes can be like time capsules for the ocean,” Gaskell said. “At around 15 to 20 meters deep, there were huge Birdsnest Corals (Seriatopora) and super elongated Staghorn Corals (Acropora), both of which were among the biggest and most delicate colonies I’ve ever seen,” Mr Gaskell said. Open to the ocean at one end, and closed in by Reef at the other. The total length was over a 1Km long, about 50m wide and the depth is still unknown. The strong current along the walls meant we had to drift the whole way. This video doesn't do the site justice as most of the bigger inhabitants were not keen to come close. Only filmed fish and corals at the top on the edges. Freediving into the depths we saw Grey Reef Sharks, Whitetip Reef sharks, Maori Wrasse, a Tawny Nurse and a 3m Lemon shark. Seeing a huge school of Humpnose Unicornfish was definitely my highlight. Counted over 100 in one photo. Want to know exactly where it is? Sorry, it's still a secret. The blue hole sits in the heart of the Great Barrier Reef off the Whitsunday Coast. “Its location is in one of the least explored parts Great Barrier Reef, over 200 km from Daydream Island. " "Hopefully it will be left alone. 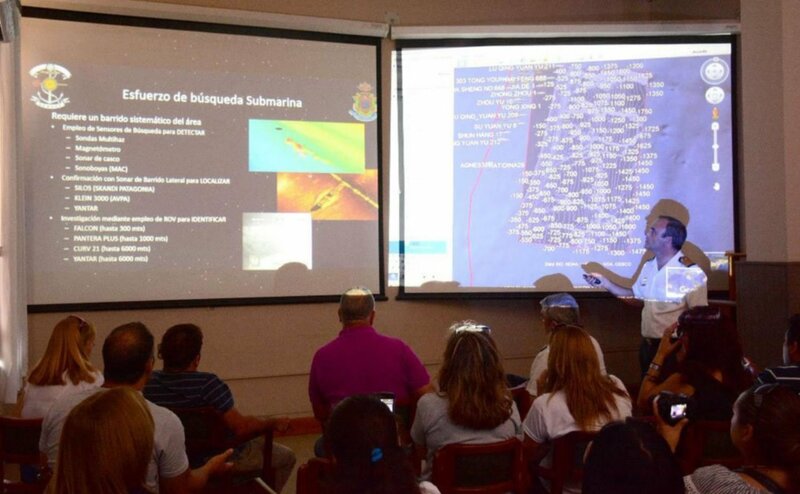 An influx of divers would severely damage the coral colonies, as they are more delicate than usual." 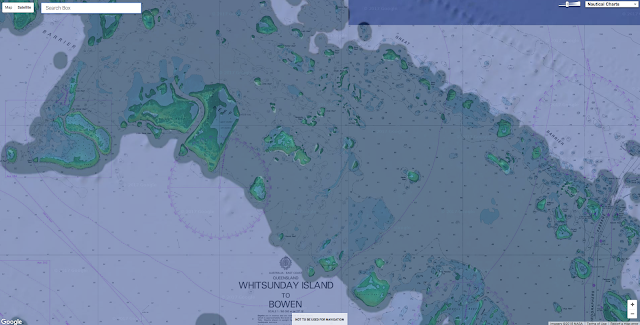 Picture : nautical charts (Australia AHS) overlaid upon Google Maps imagery in the GeoGarage platform webmapping. It's a long way offshore this spot, but hopefully we'll get back there one day. 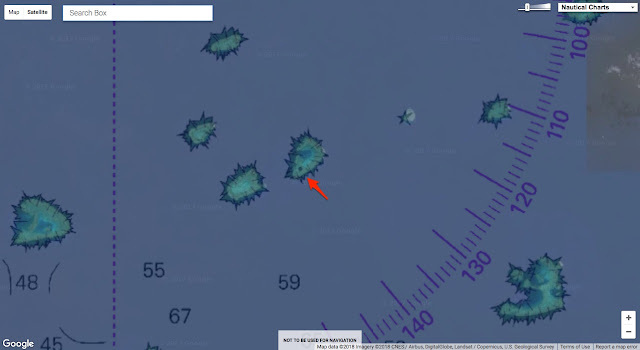 Example of another Blue Hole in the GBR found in the GeoGarage platform ? There are a couple of known blue holes in Australia but they are quite unexplored and due to the sheer size of the Great Barrier Reef, its certain that more are out there. Wonky Hole is 80 metres (262 feet) deep and an amazing dive teaming with sea life and covered in whip coral and gorgonians. The Barrier Star is another hole dropping to 90 metres (295 feet) with an overhang at the sandy bottom and an abundance of reef life and coral. Gaskell plans to continue looking for and surveying blue holes in the Great Barrier Reef. “Some of these sites have had scientists explore them in the past, but due to the remote offshore location, there are still parts of the Great Barrier Reef that remain a mystery,” he said. The Russian navy is very proud of its new spy ship, the Yantar, which is now doing Argentina a favour by helping to search for a missing submarine. 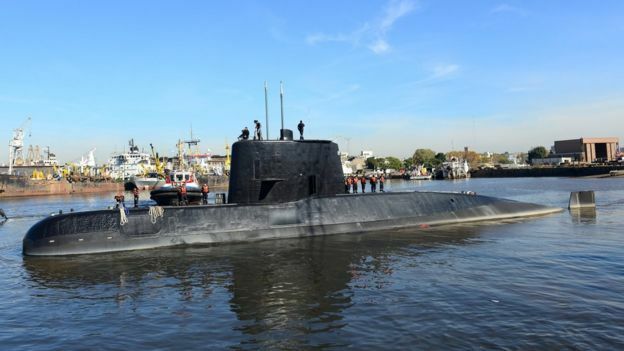 Argentina has given up trying to rescue the 44 crew aboard the ARA San Juan, which disappeared on 15 November. But it still wants to find the diesel-electric submarine. Enter the Yantar, officially an oceanographic research vessel, but actually bristling with surveillance equipment, and the mother ship for manned and unmanned deep-sea submersibles. 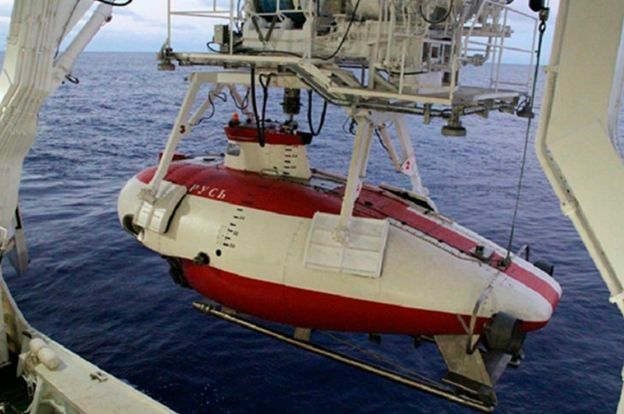 A Russian ROV - remotely operated underwater vehicle - is scouring the ocean floor off Argentina. But what else has the Yantar (Russian for "amber") been up to? The Yantar's movements were apparently what prompted a warning last month from the UK military that Russia could disrupt or cut vital undersea communications cables. The chief of the UK defence staff, Air Chief Marshal Sir Stuart Peach, said such a strike against internet and other communications cables could be "catastrophic". 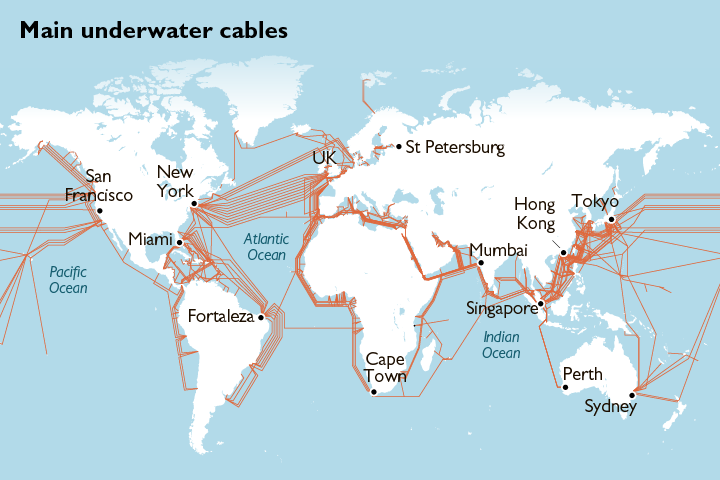 Dozens of fibre-optic cables span the globe and Nato also has dedicated military cables on the ocean floor. The Yantar is capable of tampering with them, says Igor Sutyagin, a London-based expert on the Russian military. But there is no evidence that it has done so. "It's difficult to tap into optical fibres - it's just light inside, not electrical data," he told the BBC. "It would be easier just to cut the cable." Mr Sutyagin noted that in the 1970s, during the Cold War, the US Navy had lost control of a Sosus undersea listening post for tracking submarines in the Atlantic. Sosus stands for "Sound Surveillance System". 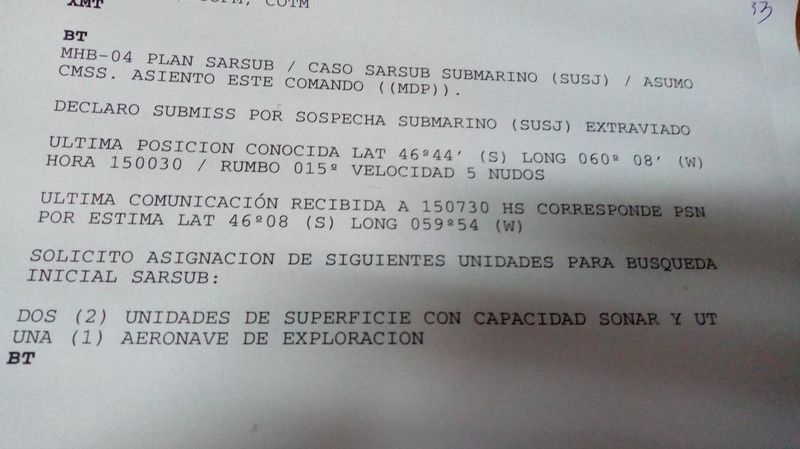 The US military concluded that a Soviet submarine had cut the cables. In the same period the US military, reports say, planted listening devices on Soviet undersea cables in the Sea of Okhotsk, where Soviet submarines were based. A news report from the Russian parliament says the Yantar can do just such clandestine work, using deep-diving submersibles. 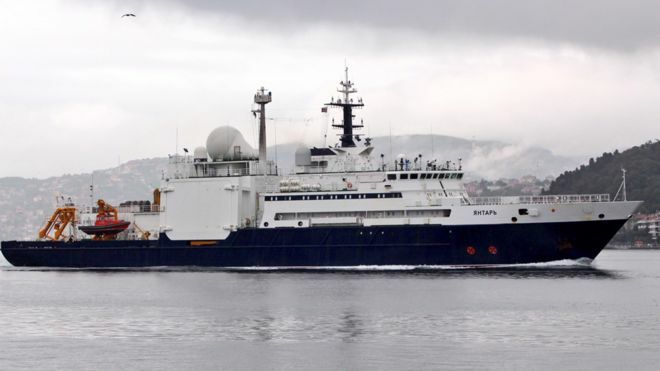 "The Yantar has equipment designed for deep-sea tracking, and devices that can connect to top-secret communications cables," said Parlamentskaya Gazeta (in Russian) last October. Mr Sutyagin, of the Royal United Services Institute, says the Yantar belongs to Russia's Main Directorate of Underwater Research (GUGI in Russian), part of the defence ministry. The 108m-long (354ft) vessel has a crew of 60 and went into service in 2015. It was built in the Baltic port of Kaliningrad, the first in a series called Project 22010. A second, called Almaz, will soon be on its way to the navy. Russia already has several older spy ships. In April, one of them, the Liman, sank off the Turkish coast after being breached in a collision with a freighter. All its crew were rescued. The Yantar can deploy the three-man submersibles Rus and Konsul, which can dive to about 6,000m (20,000ft). The Russian parliamentary report noted that in the summer of 2015 the Yantar had deployed near the US Kings Bay naval base in Georgia. "According to Pentagon officials, the Russians were gathering intelligence on US submarines' equipment, including underwater sensors in the DoDIN network," the Russian report said. Mr Sutyagin said the US underwater sensors near Kings Bay would be interesting for the Russian military, which might wish to copy the US technology. In late 2016 the Yantar was found to be loitering over undersea communications cables off the Syrian coast, including some links to Europe. The Yantar's frequent stops at points along a cable route suggested that a submersible was examining the sea floor, the report said. the last known position of the ship on November 15 was 46°44 ‘ south, 59°54’ west. 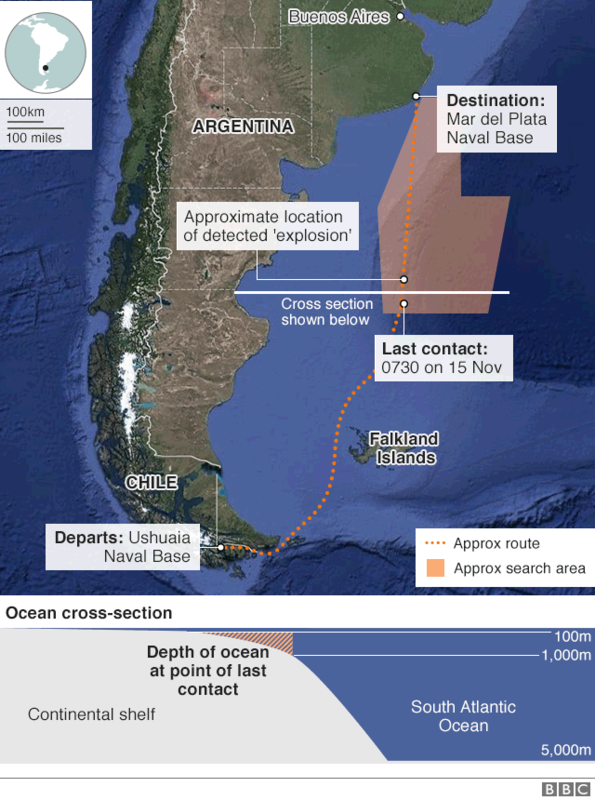 Besides the Argentina mission, the Yantar has been used previously for search and recovery. The Russian parliamentary report said the ship had located two Russian fighter jets - a Su-33 and a MiG-29 - that crashed into the Mediterranean in 2016, during the Syria war. The Yantar "recovered secret equipment from the planes in good time", the report said. That could be secret radar or missile data, or the "identification, friend or foe" system, Mr Sutyagin said. In 2000 a ship like the Yantar might have saved some Kursk sailors' lives and literally salvaged the Russian navy's reputation. The bottom of the ocean is more of a "sunken place" than it used to be. In recent decades, melting ice sheets and glaciers driven by climate change are swelling Earth's oceans. And along with all that water comes an unexpected consequence — the weight of the additional liquid is pressing down on the seafloor, causing it to sink. Modeled barystatic contributions and definition of the individual ocean basins. 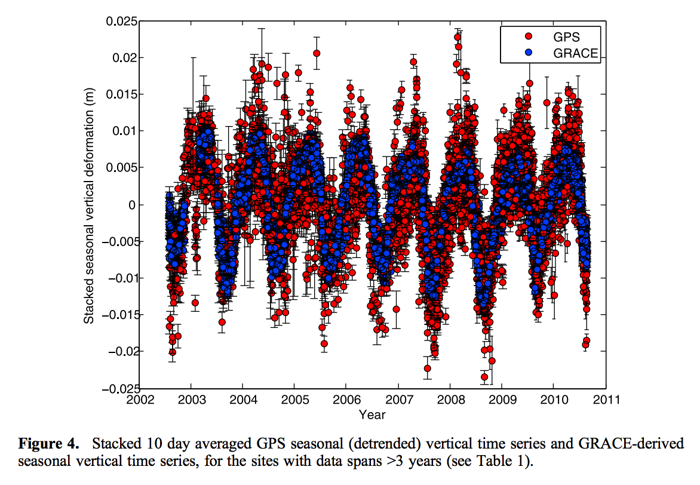 (a) Time series of the modeled barystatic sea level changes from each individual process and their sum. The shaded areas show the 1σ confidence interval. b) Definition of each ocean basin. The dots show the tide gauge locations, and the color the basin to which each tide gauge is linked. The black lines show the upper and lower bounds of the altimetry domain. Scientists have long known that Earth's crust, or outer layer, is elastic: Earlier research revealed how Earth's surface warps in response to tidal movements that redistribute masses of water; and 2017's Hurricane Harvey dumped so much water on Texas that the ground dropped 0.8 inches (2 centimeters), the Atlantic reported. Linear trends and accompanying 1σ confidence intervals resulting from ice mass and LWS changes over 1993–2014 in (a) solid Earth deformation over the oceans, (b) relative sea level, and (c) geocentric sea level. Note that geocentric sea level change is equivalent to the sum of relative sea level and ocean bottom deformation change. The blue line depicts the line where local sea level change is equal to the ocean mean sea level trend, whose value is written in blue under each map. In the new investigation, researchers looked at more long-term impacts to the seafloor. They evaluated how much the shape of the ocean bottom may have changed between 1993 and 2014, taking into account the amount of water added to the ocean from liquid formerly locked up on land as ice. Previous research into seafloor stretching had omitted that extra water, the scientists wrote in the study. To do that, they reviewed approximations of mass loss on land, as ice melted and drained into the oceans, and compared that to estimates of sea volume changes. They found that around the world for two decades, ocean basins deformed an average of 0.004 inches (0.1 millimeter) per year, with a total deformation of 0.08 inches (2 mm). Basin-averaged and global mean effects of present-day mass redistribution on observed relative and geocentric sea level change. The solid line represents the average spatial signal over each region. 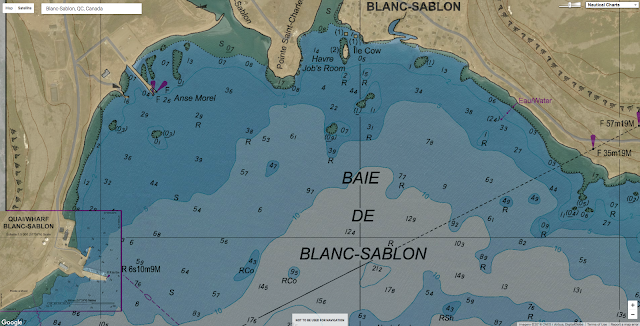 The dashed line (“TG rec”) represents tide gauge reconstructions based on the virtual station method using the locations of the 627 PSMSL tide gauges. The altimetry domain consists of the global oceans, bounded by ±66∘ latitude. For the virtual station estimate of the altimetry domain, all regions except the Arctic Ocean region are used. The accuracy of future sea-level estimates could be notably improved if the sinking of the ocean floor were incorporated into the calculations, "either based on modeled estimates of ocean mass change, as was done in this study, or using more direct observations," the scientists concluded. The findings were published online Dec. 23 in the journal Geophysical Research Letters. In the last three years Médecins Sans Frontières (MSF) has carried out nearly 400 search and rescue operations in the Mediterranean Sea. Every year thousands of refugees, many fleeing from violence, war, persecution and poverty in Sub-Saharan Africa, drown while trying to reach Europe via the Mediterranean. MSF has saved thousands of other refugees from suffering the same fate. The MSF Search and Rescue interactive map shows the locations of all of MSF's rescues in the Mediterranean since 2014. The majority of these sea rescues have taken place off the coast of Libya. The MSF says that "almost everyone rescued from this stretch of water has passed through Libya, where many of them have been exposed to alarming levels of violence and exploitation". More than 5,000 refugees died in 2016 trying to get to Europe across the Mediterranean Sea. Crossing the Mediterranean Sea by Boat - Mapping and Documenting Migratory Journeys and Experiences is an international research project, led by the University of Warwick, which carried out 257 in-depth qualitative interviews with people who have made this journey. The project has released an interactive story map which allows you to view some of these migratory journeys on a map, while also learning about the individual experiences of the people who actually made the journeys. Each of these individual journeys are mapped to show each stage of one refugee's migration from Africa to Europe. 'Back' and 'Next' buttons allow the user to follow each stage of the journey made by the interviewed refugees. As the map updates the map side-panel also updates to provide information about the journey. This information includes the first-hand experiences of the individual refugee and more general information about the conditions that refugees experience at the mapped locations. 15 Years: Fortress Europe is an animated map of migrant and refugee deaths in Europe over the last fifteen years. The map uses data from the Migrant Files to show where and when migrants have died while trying to get to Europe, or while trying to move around the continent. As the map plays through the fifteen years of data red markers are added to the map to show the location of each migrant death. The map sidebar continually updates to show details about each migrant death and you can click on individual markers on the map to read more details about each of these deaths. Since 2013 the Migrant Files has been maintaining a database of migrants who have died in Europe or on their way to Europe. The database lists more than 30,000 people who have died trying to get to Europe since the year 2000. The Silk team has also created an interactive map from the Migrants' Files data examining the number of migrant deaths in the Mediterranean. Their map allows you to query the information about migrant deaths by year, location and cause of death. The Migrant Map 2000-2015 is another interactive map of the Migrant Files data, visualizing the number of dead or missing migrants across Europe and Africa. The map presents a truly shocking picture of the scale of this human tragedy. You can select markers on the map to learn more about the individual cases reported and about the source of the information. The map also includes an animated heat-map layer which helps to highlight some of the hot-spots for migrant deaths over the last six years.